In 1979, the streets of Iran's capital city, Tehran, turned ugly. Six Americans caught in the uprising found protection at the Canadian embassy. Through the feverish efforts of the embassy staff, the fugitives were disguised as Canadians—complete with fictitious passports—and able to escape the country.History is full of such daring escapes, often creative, always heart-pounding. 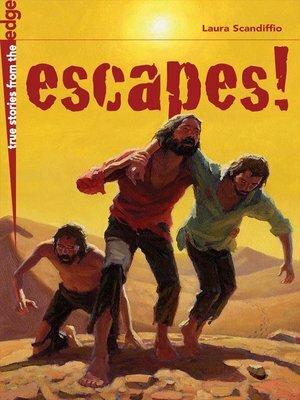 Escapes! recounts ten of these nail-biting tales. Discover Lady Nithsdale's ruse to free her husband from the impenetrable Tower of London in 1716. Fall into Douglas Bader's harrowing escape from a plummeting Spitfire in WWII. Hold your breath as two families drift over the Berlin Wall in a homemade hot-air balloon!From getaway gladiators to runaway slaves, from the endless Sahara to the impassable Bastille, each exciting story will have young readers eager to escape into the next! Laura Scandiffio has worked as an editor for both children's and adult trade books. As an author, her previous book, The Martial Arts Book, showcased her love of history, her meticulous research, and her knack for storytelling.